In this challenge an audio file is given and it is required to find the flag hidden in it. This is an example of how a challenge should not be solved. For sure there was a better way that we do not know. 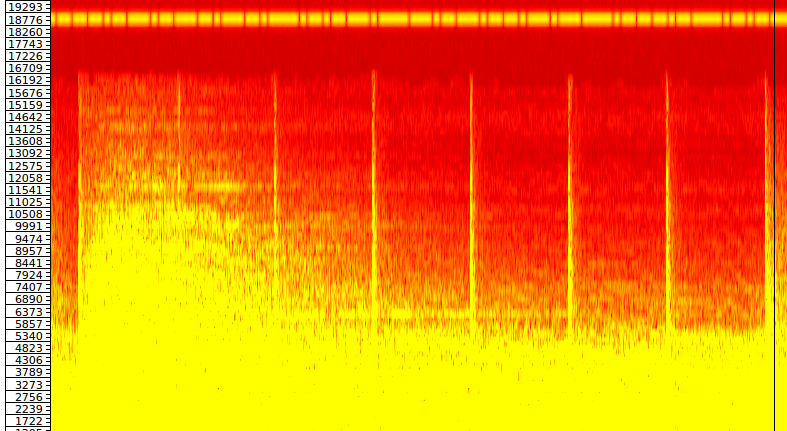 By looking at the spectrogram (using sonic visualizer) we can see that there is some sequence hidden at frequency 18k. We can use audacity to extract that frequency, by using an high-pass filter and by amplifying the result. Let us export the result and extract the bits contained in this wave. We can use the following lines to extract the bits, by passing a frequency and a threshold. We can see that there are some space in the first part, and no spaces on the second part. Thus, the second part could be the flag. By replacing 41, 22, 12, 122, with f,l,a,g and then continuing to guess other characters considering their frequencies, we can find the meaning of each subsequence.